This entry was posted on February 21, 2018 by MidMeds. It all started with a paper tube. Modern stethoscopes: 200 years in the making. In 1816, French physician Rene Laennec invented the first stethoscope using a long, rolled paper tube to funnel the sound from the patient's chest to his ear. Accounts vary on exactly how Laennec created his invention, but it was clear from the beginning that acoustic properties of the tube greatly improved Laennec's ability to hear vital heart and lung sounds. Laennec coined the name 'stethoscope' from two Greek words: stethos (chest) and skopein (to view or see). He also called his method of using the stethoscope "auscultation" from "auscultare" (listen). Twenty-five years later, George P. Camman of New York developed the first stethoscope with an earpiece for each ear. This design would be used for more than 100 years with very few modifications. It wasn't until the early 1960s that Dr. David Littmann, a Harvard Medical School professor, distinguished cardiologist and recognised international authority on electrocardiography, patented a revolutionary new stethoscope with vastly improved acoustical performance. He helped to transform a simple listening device into a powerful diagnostic tool. 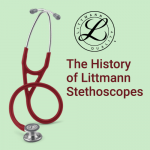 3M acquired Dr. Littmann's stethoscope business a few years later and continued to refine and improve on his designs. Today, 3M Littmann Stethoscopes are the diagnostic instrument that millions of medical professionals around the world use and depend on every day. Clinicians who take the time to learn and practice auscultation are rewarded with valuable skill that helps them quickly assess, diagnose, and monitor their patients. Stethoscopes are also an important way for clinicians to make first contact with their patients. Using a stethoscope gives a doctor or nurse permission to "touch" a patient without actually touching. It helps break the ice, easy apprehension, and establish connection and rapport. The first use of a stethoscope makes patients feel that they're being treated the right way. Littmann stethoscopes have become the gold standard by which all other stethoscopes are judged. The brand that delivers superior acoustics, innovative design and exceptional performance. MidMeds is proud to offer the entire Littmann range. Click here to view the Littmann range.